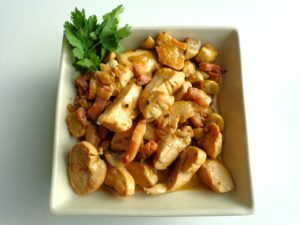 This easy recipe may be made either with skinned, boned chicken breasts or a whole, chopped chicken (bone in, skin on). The cooking time is longer if using bone-in pieces. For best results, buy free-range or organic chicken, and choose thick-cut bacon. You can also use ready-made lardons from the supermarket if available. This dish is generally served over rice. The quantities below will serve 4 people. If using a whole chicken, have the butcher chop it into pieces for you. If using boned breasts, slice them crosswise into strips, and then into bite-sized pieces. Chop the bacon crosswise (cube it), first removing the rind if necessary. Peel and mince the onion. Rinse the mushrooms, slice off the bottoms and cut into quarters. Heat 1 tbsp. of the oil to sizzling in a large skillet. Add the chicken pieces and sauté, stirring, until they start to brown. Remove the chicken and juices to a bowl. Return the skillet to the heat and add the rest of the oil. Add the bacon and sauté, stirring, for about one minute. Add the onion and continue cooking until it starts to wilt. Add the mushrooms and sauté, stirring, for another two minutes. Return the chicken to the skillet. Add the wine and water. Add a pinch of thyme leaves or rosemary leaves (or both). Add the salt and grind in some black pepper. Reduce the heat and simmer for 20-30 minutes, stirring occasionally. If the sauce reduces too much, add a little more water. When the chicken is cooked through, add the cream and stir well to blend with the juices. Taste and adjust the seasonings if necessary. Allow the cream to bubble for a couple of minutes to thicken. Garnish with fresh herbs if desired, and serve over rice. Serves 4.